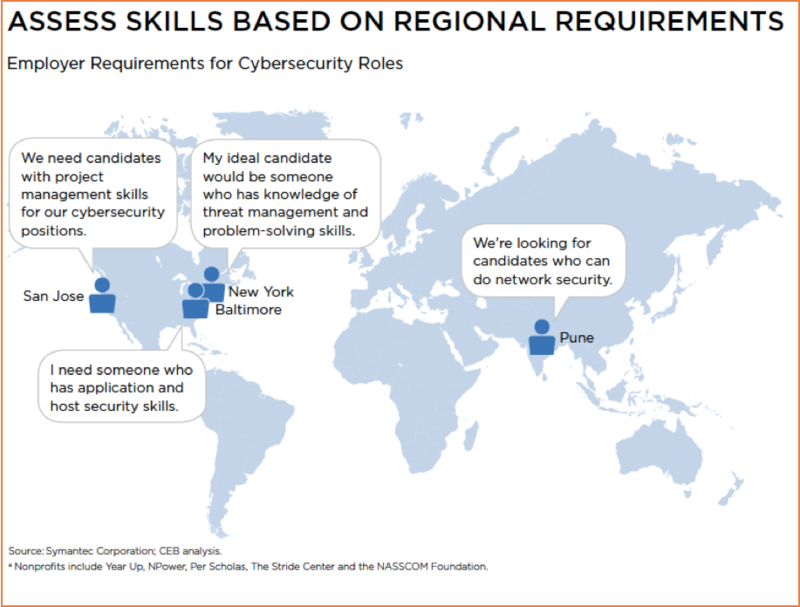 Symantec and its nonprofit partners assess employers in different regions to understand the types of cyber security skills that are needed. Symantec C3 training focuses on hard and soft skills for the workplace. 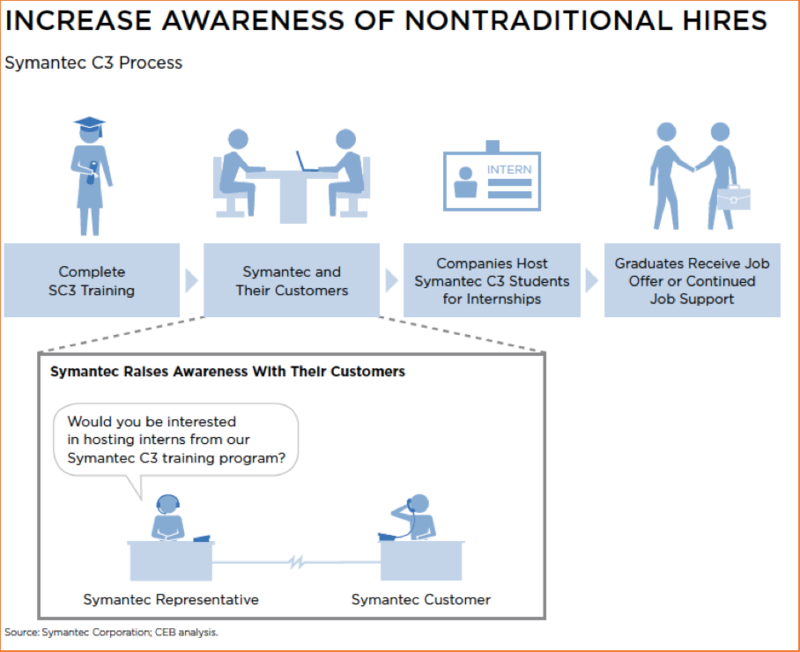 Symantec’s four-step process for training and placing nontraditional talent. To address the shortage of cyber security talent, Symantec first launched its Cyber Career Connection (Symantec C3) in 2014. It partnered with workforce development nonprofits to prepare nontraditional candidates — including women and people of color — for careers in cyber security. Later, the program was expanded to prepare other underrepresented groups who face barriers to employment, such as veterans and under-resourced young adults. The program’s goal is to help close the cyber security skills gap by investing in skills training, hands-on experience and job-placement support for young adults without college degrees. The results are two-fold: Recruiting leaders have a new, more diverse pool of candidates to consider and qualified nontraditional candidates have new job options in entry-level technical roles. Assess skills based on regional requirements. Define hiring needs specific to regional skill requirements. The assessment helps ensure that Symantec C3 students are prepared to fill jobs in their region. Tailor training to hiring needs. Equip nontraditional candidates with both hard and soft-skills training. Through tailored training, Symantec C3 students learn technical skills required to pass industry certifications, as well as soft skills necessary for success in the workplace. Soft-skills training is especially important since candidates with alternative credentials may not have had the opportunity to develop these skills in previous careers. Increase awareness of nontraditional hires. Increase awareness of the need to hire candidates without traditional four-year technology degrees. Partnering with reputable employers that hire non-traditional talent influences other companies to do the same. By considering non-traditional talent pools, organizations can increase the supply of candidates for their open roles, thereby improving recruiting outcomes. Build executive support for considering nontraditional candidates. Highlight the successes of candidates without four-year college degrees who have technical training or certifications as well as the direct benefits that a diverse workforce brings to a company. Help hiring managers understand that rebalancing technical job requirements with nontechnical requirements does not lower the quality bar for applicants. Include soft-skills training in onboarding plans for entry-level IT and cyber security roles to support candidates with nontraditional backgrounds.